The pre-school unit consists of 1 large room, which makes a happy self-contained environment for Pre-School Education. The staff ratio for the pre-school unit is 1:8. 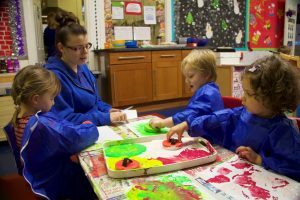 We strongly believe that children ‘learn through play’ and for this purpose appropriate equipment and materials available to enrich the children’s enthusiasm to learn. 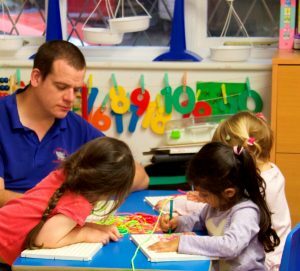 Pre-school educations includes: language, reading, writing, maths, learning about the environment, the world and themselves. All children are encouraged to use computers. Themes are selected monthly and visits are arranged from fire fighters and other local services. Also children venture out on the occasional field visit under the appropriate supervision of staff (ratio 1:2). We follow the National Curriculum in line with the guidelines set by the Office for Standards in Education (OFSTED). Each child has their own progress report on file and these are available for inspection at any time. Children leaving Millwood House are well prepared for entrance into any private or state school. Leaver’s reports are supplied on request.